I created this clean and simple card using the Lawn Fawn chevron stamp that is great for backgrounds and used a die cut sentiment from Simon Says Stamp. I stamped the design with Hero Arts ombre ink. 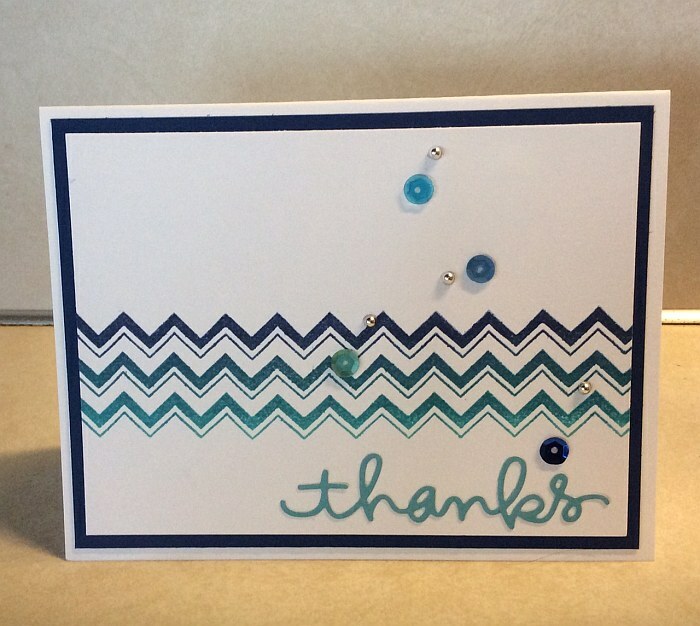 The Addicted to CAS Challenge #68 was to use chevron on a clean and simple card. The Operation Write Home (OWH) – Our Daily Bread Challenge for July is a Thank You card. And I added a little bit of sparkle and shine to this card for the Simon Says Stamp Wednesday Challenge Blog. It’s a three-fer! What fun! This might be my last OWH card. Maybe. Thanks for visiting today! This entry was posted on Saturday, July 25th, 2015 at 6:16 pm	and tagged with cardmaking, clean and simple stamping, die cuts, Hero Arts, lawn fawn, Simon Says Stamp, stamping and posted in Addicted to CAS, Challenges, Clean & Simple, OWH, Simon Says Stamp, Thank You. You can follow any responses to this entry through the RSS 2.0 feed. Beautiful inking to your chevron stamps – loving the ombre effect and the sparkle from those sequins is just awesome. Thanks for playing along at ATCAS. Great CAS card, love the colors! thanks for playing along with us at ATCAS! This is very nice! I love the blues! Thanks so much for playing along with the Simon Says Stamp Wednesday Challenge!